This 2 bedroom newly renovated apartment offers a unique opportunity to live in a magnificent Grade ll listed sandstone mansion that dates back to 1861. 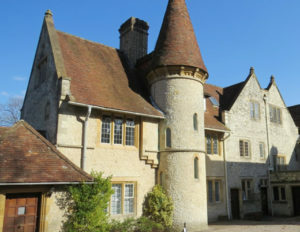 Designed by the eminent Victorian architect Samuel Sanders Teulon, it is in a breathtaking setting within the South Downs National Park amidst the chalk hangers, close to Hawkley. The main house is approached via a long drive and hidden from the road. The apartment provides 2 bedrooms, living room, kitchen and bathroom. The sitting room has French doors onto a balcony which could comfortably fit a table and chairs and from where you can enjoy the most wonderful views. The kitchen is modern and includes electric cooker and hob, integrated dishwasher, under counter fridge with freezer compartment and velux ceiling window above. The master bedroom has dual aspect windows and feature beams and the second bedroom has a feature fireplace. The apartment has been finished with contemporary décor while retaining some character features, creating a smart home for a single professional or couple. 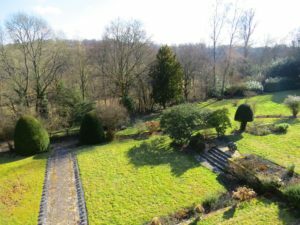 Externally the property provides off road parking to the front of the house and use of the stunning communal grounds which extend to about 8 acres. They are mostly wooded and run down to a stream which is a source of the River Rother. The area has a dramatic, unspoilt landscape dominated by The Hangers; ancient woodlands which cover the slopes at the edge of the Hampshire Downs and so called because the ancient beech, lime, yew and ash woodlands seem to hang from the tall slopes creating a wonderful canopy for walkers. Rich in wildlife and with spectacular scenery, the area is deeply rural and quiet, with small villages and scattered farms. Hawkley is a rural village with a quintessential village green, pub, church and village hall. The market town of Petersfield is only 7 miles away with a mainline station and good range of shops and facilities. Chichester, Winchester and Guildford all offer more extensive shopping and leisure facilities. With easy access to the A3, connecting to the M25 and the rest of the motorway network, this property is, though rural, well placed for commuting. The closest mainline services run from Liss and Petersfield, with trains to London Waterloo on a regular service taking just under an hour. The area is well served for sporting and leisure facilities which include horse racing at Goodwood and Fontwell, polo at Cowdray Park, golf at Hindhead, Liphook and Petersfield and sailing off the South Coast at Chichester. The surrounding countryside is networked by footpaths and bridle paths providing excellent opportunities for walking (including the Hangers Way and the South Downs Way) and riding.